a page that you can learn more about it. Umpqua River Lighthouse has been a steady and welcome beacon for anyone navigating the Oregon Coast, but now the Coast Guard is debating whether to keep the light shining. 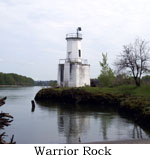 Visit the Friends of Umpqua River Lighthouse to see how you can help. In April 2010, author Jim Gibbs past away. He was a great friend to the lighthouse community and will be missed. Click the link below to read an article about Jim that was originally published in the Newport New Times, then reprinted and provided to us by our friends at the Washingon Light Keepers Association. provided by Oregon State Parks. Travelers along the Oregon Coast and to a headland north of the Columbia River are treated to a spectacular view of lighthouse history. From Cape Blanco in the south to Cape Disappointment in the north, there are nine lighthouses, the oldest dating back to 1856. Each one within a few miles of U.S. Highway 101. These nine lighthouses, and one that can be seen on an offshore rock, are the survivors of fourteen lighthouse stations built to guide mariners along the Oregon Coast and up the Columbia River to Portland. They had their beginning when the Pacific Nortwest became a U.S. Territory in 1848. When the territory was established, the Oregon Coast was the domain of Native Americans. They fished the coastal rivers, canoed its bays, and dug for shellfish on long, sandy beaches. But along the lower Columbia and Willamett rivers, Oregon Trail immigrants had been building settlements, farms and mills. With the 1848 discovery of gold in California, the lower rivers were becoming busy waterways. Ships crossed the treacherous Columbia River bar a sailed upriver to load lumber, flour and produce for markets in San Francisco. The settlers were so dependent on maritime trade that with the territorrial act, Congress voted to construct a lighthouse on Cape Disappointment, at the Columbia River's entrance, and one at New Dungeness on the Strait of Juan de Fuca. It was the first offical action to establish lighthouses on the West Coast. Besides agreeing to build the new territory's lights, Congress stipulated that other potential lighthouse sites along the West Coast be investigated before construction began. The U.S. Coast Survey was selected to make the study. The Coast Survey party arrived at San Francisco in the spring of 1849. They found its shores lined with abandoned vessels, their crews gone to the gold fields. The discovery of gold had caused maritime traffic along California's coast to burgeon. The Coast Survey investigated potential lighthouse locations from the Strait of Juan de Fuca to San Diego Bay. By 1851 they had recommended sixteen lighthouse sites: ten in California, five in what would become Washington state, including Cape Disappointment, and one at the mouth of Oregon's Umpqua River. Construction of the first lighthouses began in 1853, but the completion of Cape Disappointment's lighthouse was delayed until 1856. The Umpqua River's lighthouse wasn't completed until 1857. By then Oregon's coast was no longer the home of just Native Americans. Gold had been discovered in southwest Oregon. Ships carrying settlers and miners had crossed the bars of the Umpqua, Coos, and other coastal rivers. Oregon's real "gold," however, lay in its vast resources of timber, saslmon, agricultural produces, and coal. Entrepreneurs had been quick to take advantage of California's early gold rush demand for these products. As maritime trade serving California and world markets expanded, more and more vessels were put at risk in Oregon's fogs and gales, and on dangerous river shoals and bars. These risks were gradually reduced as more lighthouses were built, and a lightship was anchored near the Columbia River's entrance. The heart of early lighthouses was the Fresnel (pronounced Fray-nell) lens. Handcrafted in Europe, the lens' prisms focused light into a powerful beam. Until electricity came to the stations, the light for the lenses came from lamps burning a variety of fuels from whale oil to kerosene. In dense frgs, however, even the most powerful beam of light was useless, so some stations also had fog signals. The soul of the lighthouse stations was their keepers. They tended the lights from dusk to dawn, often with the help of their families, and operated the fog signals. The keepers of the lightship lights were crews who manned the stout little vessels. Lighthouses and lightships were first built by the U.S. Lighthouse Board with funds authorized by Congress. The Board ran the U.S. Lighthouse Service, which was responsible for operating the lighthouses, the lightships, and the depots and tenders that serviced them. In 1910 the Lighthouse Board was abolished, and the Breau of Lighthouses was put in charge of the Lighthouse Service. In 1939 the lighthouse system became the responsibility of the U.S. Coast Guard. The Coast Guard began to automate the lights and fog signals in the 1960's. Some early Fresnel lenses were replaced with aero beacons or small modern optics. No longer needed, the resident keepers gradually left their stations. A large buoy replaced the Columbia River Lightship. Though still providing comfort to mariners, lighthouses are now less important to safe navigation. Radar and geographic positioning systems have become the mariners' guides. However, the lighthouses remain as symbols of Oregon's maritime heritage. Government agencies and private groups have made great strides in the repair, restoration, and preservation of the surviving lighthouses, and most are accessible to the public. The last lightship stationed at the Columbia's entrance is moored at Astoria's Columbia River Maritime Museum.